Visa requirements for different Nationalities/kids are specified online http://www.eta.gov.lk/slvisa/. Visa on arrival is not available. Please check the requirements and obtain an ETA (Electronic Travel Authorisation) prior to arrival in Sri Lanka. You can apply online on http://www.eta.gov.lk/slvisa/ upto 90 days ahead of travel. It’s quite easy to apply and if you are requested for an address in Sri Lanka you may include the address of your first hotel. Please keep a printed copy to show on arrival at the Airport. When is the best time to travel to Sri Lanka and what to expect? There is no actual “best” time to visit. Sri Lanka is really a four season destination. So best time is largely dependent on your specific interests. If you're looking for the best (low season) rates for accommodation in Sri Lanka, think of traveling in March, May, June or September. February to March: Nice warm weather continues but beginning to get really hot by March - think mid 30°C with humidity making it feel hotter(stay well hydrated), best hotel deals during the month of March. South and west coast beaches still in season. February is a lovely quiet time to travel if you want to avoid crowds. April: The hottest and driest month with temperatures reaching mid 30°C. Avoid sightseeing from late morning 11 am till about 3 pm especially in the Cultural Triangle and North Central regions. Local school vacations and Sri Lankan New Year holidays can make cultural sites and wildlife parks crowded. Tail end of the beach season in the south and west coasts but the east coast beaches just beginning to look good. May to June: South-West monsoon time with sharp bursts of rain along the south and west coasts including Tangalle, Mirissa, Galle, Weligama and Colombo. Humid nights. Great beaches on the east coast though. Great rates on offer for accommodation as it's a rather quiet time of year for tourism. July: A great time to travel especially towards the east and south east coast. Nice hot weather. Early July is not yet the peak tourist season. Cultural Triangle and the North Central Province being extremely dry. Great time to see wildlife across the country. (The Annual Kandy Perahera sometimes falls during a 10 day period in July, when peak season supplements apply and accommodation gets booked up pretty fast). August: Not as hot as April but hot weather across the island. Peak Summer holiday season and local school holidays, so a busy period across Sri Lanka. Lovely beaches in the East and south east coast. (If the Annual Kandy Perahera falls during a 10 day period in August peak season supplements apply and accommodation gets booked up pretty fast). September: Dry weather with temperatures around 30°C. Drought conditions may arise in the deep south, south east and north central regions and some wildlife parks may be closed for visitors until mid October - please check before you book your safari. Tail end of the season for east coast beaches. October : Low tourist season. October is when the inter-monsoon period begins. Rainfalls are intermittent and does not last throughout the day, but rains are far more likely to happen than in September. So if it's just a long stay beach holiday that you are after, its not ideal. However, for a holiday with a mix of culture, wildlife and a few days by the beach it's actually a lovely quiet time to travel with uncrowded sites and national parks and great rates on offer. The weather has become very unpredictable (like elsewhere in the world). November: Low tourist season. North-east monsoon begins to hit the east coast. Inter-monsoon conditions across the island make it a less than ideal time to travel even to the south in terms of weather. Continuous rainfall during the day with thunder and lightning. Cool days and nights. Great rates on offer across the island. December: Monsoons taper off only towards mid December and temperatures can reach mid 20°Cs across the island and may even be low single digits in the Hill Country. Very comfortable weather to travel. Great beaches in the south but peak season rates apply across the island. What’s the best time for wildlife in Sri Lanka? Check out our Wildlife Calendar to see which National Parks are in season and what wildlife you can spot on safari. Insightful Ayu in the Wild Guides make wildlife fun with their incredible knowledge of animal behaviour, sounds, spoor, ecology and more. Sri Lanka is malaria free. We do recommend that you consult your usual GP or Travel Clinic for up to date information on vaccinations required. Covering any exposed skin will help prevent mosquito bites. Use a repellent containing 20%-30% DEET to prevent mosquito bites. Citronella Oil is a great natural remedy for preventing mosquito bites but ensure you are not allergic to it. Wear neutral-coloured (beige, light grey) clothing -darker colours tend to attract mosquitos. Local currency is Sri Lanka Rupees (LKR). You can bring Dollars, Pounds and Euros which are widely accepted but rates will vary across different cities and Banks for currency conversions. It is advisable to change to local currency at the airport for best exchange rates. Keep sufficient cash-securely, as credit cards may not be accepted at some Eco Lodges but are accepted at all major Hotels. ATMs are available at major cities. Are travel times long between destinations? With the recently opened Expressways, travel times have been cut down drastically along some routes. However, depending on your itinerary and the time of day you travel in, it can be long but we try to keep it to about 3 hours. If this is not possible, we factor in places for quick stops to stretch your legs. Tipping is an accepted practice in Sri Lanka. An average to good range of tipping is between US$10-20 per day per person. For Housekeeping an average of Rs. 100 per day and at Restaurants a 10% service fee is acceptable. However, for family tours or group tours of over 2 pax please use your discretion in arriving at a suitable tip per group or per family which can fall within or outside the above range in total. Locals will gladly accept your generosity but tipping is entirely at your discretion. Our network of Chauffeurs, community guides who host our experiences, safari guides, jeep drivers and naturalists may not have crisp uniforms which say ‘Ayu in the Wild’. That’s only because we prefer them to be comfortable in their own local attire – we promote everything local, even the sarong. (Try it, you may like too.) Our network of Sri Lankans may speak to you in faulty and hesitant English. But because of them, your holiday will be something special. Do feel free to be generous to all these Sri Lankans at the end of your bespoke holiday. How do I get around Sri Lanka? A combination of transport options are now available and Ayu in the Wild Holidays can advice you on the best options depending on your holiday route. By Road: Its best to hire a vehicle and a driver (chauffeur) to get around on longer tours. All Ayu in the Wild bespoke holidays include a private chauffeur driven vehicle, airport transfers, fuel, toll costs, decent accommodation and meals for the chauffeur, telephone costs for coordinating any tour details with us and a living allowance. We provide English speaking experienced chauffeurs, some who we have known for decades. A fleet of air conditioned vehicles are at your disposal to choose – from cars (maximum 3 persons), SUVs (maximum 3-4 persons), vans (maximum 6 persons), coaches (for larger tour groups). In the event of a breakdown we will immediately coordinate for a replacement vehicle to continue with your holiday uninterrupted. We do not provide Chauffeur Guides as we prefer that our guests see the island through the eyes of several local community based hosts. By Rail: There are some wonderful scenic railway journeys that we can design into each bespoke tour depending on the route. The best ones are from Ella or Haputale to Peradeniya(Kandy), Nanuoya to Ella while Colombo to Kandy by rail is also a quicker option to travel than by car. The coastal route between Colombo to Galle and vice versa is also lovely. By Air: Cinnamon Air offers internal flights. Some of the best flight connections are on a sea plane from Colombo to the southern coast in Koggala and Dickwella and to Kandy, Sigiriya, Trincomalee and Batticaloa. Special Charter flights can be arranged by us at special agents rates to several places on the island. Guiding - What to expect when you book with Ayu in the Wild? Our ethos is that the best local experiences in Sri Lanka are guided by true locals who know their country best. When you travel with Ayu in the Wild, you see Sri Lanka through the eyes of the locals. Not through the eyes of one chauffeur-guide or a non-local host. We provide insider access to the best local experiences in Sri Lanka led by some of the most interesting local people you will ever meet! Each experience has been curated personally by the owners of Ayu in the Wild who also work with locals to help them become knowledgeable hosts. Hosts for our experiences come from all walks of life. Some are bohemian professionals, some are farmers, then there are Poets, community based village guides, wildlife photographers, fitness experts and the list goes on. We believe, the people you meet, make a holiday that much more special! Are there Family Rooms in Sri Lanka? Yes, with separate beds for kids but it is not common. Where Family rooms are not available, you could book a double or triple with an extra bed or an interconnecting room in hotels. In most places fold-away beds will be provided even in Family Suites. What happens if the kids play up and dont want to do an activity? Cost of entrance fees can be excluded from your tour cost, so you pay only if you go. Check with us about which activities are included and which ones are ‘optional extras’. Are wildlife safari rides comfortable for kids? The Jeep rides can be rather bumpy and are usually in open sided jeeps with bar handles for protection. The roof is generally canvas or metal but you will be safe from the sun and rain. Be prepared for a bit of wind, dust and the thrill of being in one of the top destinations outside Africa for Wildlife and you will have the time of your life. Are Railway Journeys in Sri Lanka comfortable, especially for kids? If there is one thing you must do in Sri Lanka is a train journey! We love to send our guests on the old fashioned carriages that ply the tracks in Sri Lanka, just to transport them back in time to old school rail travel that started on the island in the 1800s! 1st class is Air Conditioned while the 2nd and 3rd classes are not. Not much difference really. Reserved seating in 2nd and 3rd are wonderful, seats are comfortable with a nice table to set your belongings and read a book/play games on longer journeys and mostly, the open windows make the journey far more exciting. The bathrooms in all can be a bit of a hit and miss! Initially built to transport tea and coffee from the cool mountains of the Central Highlands to coastal Colombo for export to the rest of the world the off beat routes are an insight into everday island life. Embrace the slow travel. ..the sights ( think stunning scenery, quaint small towns and beautiful old, really old railway stations )...the sounds ( gram sellers selling hot boiled gram with coconuts salt and pepper) and mostly the people...from energetic school kids to friendly locals who love to know where you're going! Sri Lanka train travel - the old fashioned slow travel option. The old fashioned carriages that chug along the ancient railway tracks are a far cry from the speed trains that many travelers are familiar with but adults and kids love it. My kids are under 6 years, can they handle the local experiences? We will discuss each activity in detail when crafting your tour including the the duration, what time to wake up and leave (e.g; Sigiriya is best done early am, its about a 1000 steps, very doable, but the last bit of the ascent is windy and steep for young children). There won’t be any unpleasant surprises. Can I get a Booster seat or a toddler seat for my child? When you book your transport with us we will provide either a toddler sear or a booster seat depending on your child's age. *Please note that our vans do not have 3 point belts. Accommodation throughout the tour can be selected based on your budget. They can be a mix of the world’s best Small Luxury Hotels, Spa Resorts, 3-5 star Luxury Hotels, Boutique Hotels and Villas with the most blissful pampering, Tented Campsites exclusively for your use and some incredibly unique Eco Lodges. Many of the Eco-lodges are jungle-enclosed little gems with all the extra comforts you need on safari. They can also be quite secluded and isolated from any shops. It is advisable to purchase your requirement of toiletries, snacks, food, beverages (including any alcoholic beverages) etc prior to check-in at the Eco Lodges. However, please check with us about the availability of fridge/freezer facilities for storage. An advance payment is construed as acceptance of the accommodation offered. Please see the Discover Sri Lanka page for details of the accommodation. Electricity – 220 Volts/50 Hz Ac. Sri Lanka has a range of electrical sockets throughout the island and we would advise you to purchase travel adaptors with square pins and round pins. Adaptors are widely available at the airport and at hotels and wayside shops too. Some of our Eco Lodges have extremely limited network coverage but all hotels and most B&Bs have sufficient network coverage and are wifi enabled. We suggest you purchase a local SIM card at the airport before leaving the arrivals lounge. You need to pack for all seasons and reasons – culture, seasons and mosquitoes! Cotton clothing is best but be prepared for cooler mornings and evenings than what you would expect in a tropical country! A shawl or zip up jacket would be comfortable especially if traveling to the Central Highlands or taking a train ride through the Hill Country (Ella, Nuwera Eliya, Hatton). White, although cooling during humid days is not appropriate jungle-wear on safari as it is conspicuous when out in nature. Cotton light-weight clothing and a hat with a wide brim in browns, greens or khaki would be more appropriate. Long sleeved clothing/shawls are great to avoid mosquitoes and to cover up during cooler nights and when visiting cultural sites. Wear long pants comfortable closed shoes/trainers on walks. Please cover your arms and legs when visiting religious sites and temples and remove shoes when directed to do so. Always use bottled water. It’s available cheaply and freely at stores island-wide and is also provided in your vehicle by Ayu in the Wild. Complementary bottles are supplied at each Lodge/Hotel. Food hygiene is very high throughout the tour. Do try the incredible variety of Sri Lankan curries served with rice but a number of international food options will also be available. You will never go hungry! For group tours, all ground transportation will be in comfortable air-conditioned vans. For 3 pax or less an air-conditioned Sedan (car) will be used. All ground transportation have generous luggage space. If traveling on a Scenic or Photography Flight on a Light Aircraft or Helicopter, strict weight restrictions will apply to baggage allowed on board. Be prepared to carry only a day-bag of maximum 3 Kg on board (including photography equipment) – rest of the luggage will be transported overland in the Van/Car. Most Hotels/Lodges offer good laundry services with one day delivery. Prices will vary. No laundry will be offered at the Campsites or Eco Lodges. You will arrive at Bandaranaika International Airport in the suburbs of Colombo. Central Colombo is about 20 minutes drive on the Expressway but may take just over an hour depending on traffic if you arrive at mid day or during the peak traffic periods where schools and office open/close. Sri Lanka is known as one of the safest tourist destinations in the world. However it is advisable to keep your belongings safe at all times. Please bring lockable bags to keep your personal belongings at Hotels/Lodges/Campsites, while you are out of your room. Please be careful when drawing out your wallet/handbag at crowded place – especially at cultural sites. Ayu in the Wild Holidays will not be held responsible for loss or theft of your belongings. Water is an essential resource for our island, sustaining our agriculture and producing our power. We kindly request you to conserve water when bathing, brushing your teeth & shaving. Please refrain from wasting drinking water. Please switch off lights, electronic equipment & air-conditioning when not required. Please refrain from purchasing any curios or items made out of endangered species, especially ivory. It is an offense to carry around feathers, fur or other animal parts with you. Please do not purchase ancient artifacts – they are very likely to be fakes and if they are not, it is an offense to sell them commercially. Our suggested reading list for your travel and holiday in Sri Lanka is about taking a deeper look at the people of this island and places that you may tour in Sri Lanka through the eyes of Sri Lankan authors. This list has been personally curated by the owners of Ayu in the Wild Holidays Sri Lanka. The Road From Elephant Pass won the 2003 Gratiaen Prize for creative writing in English “for its moving story, for its constant feel of real life, for its consistency of narrative momentum, for its descriptive power, for its dramatic use of dialogue to define social context, capture character psychology, and trace the development of a relationship, for its convincing demonstration that resolution of conflict and reconciliation of differences are feasible through mutual experience and regard, and last though not least, for its eminently civilized handling of the last degree of intimacy between a man and a woman. The Book: Man Eater of Punani – A past rediscovered through a remarkable journey to one of the most exotic countries of the world – Sri Lanka. More than a simple tale of adventure of a man-eating leopard that terrorized the tiny village, the story is the revelation of a colourful but troubled past – a charmed life of the author. A quick read for those traveling across Sri Lanka. The Author : Sir Christopher Ondaatje was born in Sri Lanka, educated in England and built a successful career in finance and publishing in Canada. In the early nineties he sold all his business and has broken new ground as a respected book reviewer and a writer of thought-provoking books. He is a life patron of the National Portrait Gallery where the Ondaatje Wing is named after him. He was made a Commander of the Order of the British Empire (CBE) in June 2000, and awarded a Knighthood in the Queen’s honours list, June 2003. The Book: Out of the Blue – Although titled as a guide to marine mammals, the book is a personal exploration of the deep seas and and indepth compilation of marine mammal behaviour learnt through hours spent tracking pods of Spinner Dolphins, Dugongs, Ocras and Whales. A must to read for a deeper look at these fascinating creatures of the sea and at least glance through before embarking on a Whale Watching safari in Sri Lanka. The Author : Howard Martenstyn returned to Sri Lanka following an early retirement in his career in Canada and has since then pursued his passion for the wild seas off Sri Lanka. Currently a Director Director Research at CRIOMM – Centre for Research on Indian Ocean Marine Mammals he was awarded for his ‘Outstanding Contribution’ at the Marine Conservation Conference 2013 for his intensive research on marine mammals as reflected in ‘Out of the Blue’ the most comprehensive publication on the subject to date. Sri Lanka is a popular destination with a rich avian diversity. Almost 30 species are endemic to the country and there are another 70 endemic subspecies. 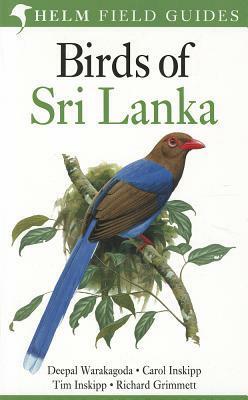 This fully illustrated guide is an essential companion for anyone interested in Sri Lanka's birds. 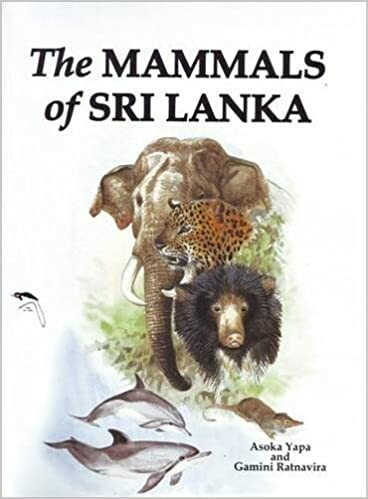 The book describes all the mammalian species in Sri Lanka known up to date, with 125+ species, both terrestrial and marine. The colored portraits were drawn by Gamini Ratnavira, who is popular wildlife artist in Sri Lanka. The other natural colored photographs were taken by numerous animals lovers, and there are unique collection of photographs, where some photos of very rare species are into the arena for the first time with this book. How to avoid and treat Prickly Heat, Dehydration and Sunburn? Drink excessive amounts of water as soon as you land to avoid dehydration and a great way to overcome Jet-lag faster. Treat dehydration by drinking plenty of water or King coconut water (the most hygienic drink available) and step into a cool shower. To avoid prickly heat wear loose cotton clothing and bathe daily. If affected use talcum powder on the affected areas and drink plenty of water. Always apply sunscreen to exposed areas to avoid sunburns. If sunburnt, apply Aloe-Vera gel or calamine lotion to affected areas. Ruhuna – Defined as “low grown” tea due to the altitude it grows at. It is a full- flavoured Black Tea. Sabaragamuwa – “Low grown”. Slightly less stronger than Ruhuna Tea. Kandy – “Mid grown” Full- bodied with a strong bright infusion. Uva – An exotically aromatic flavour with a mellow, smooth taste. Dimbula – “High grown” tea. Fine golden orange hue in the cup which is refreshingly mellow. Uda Pussellawa – A medium body with a subtle tangy flavour. Nuwara Eliya – Lightest of all types of Ceylon Tea with a delicate flavour.